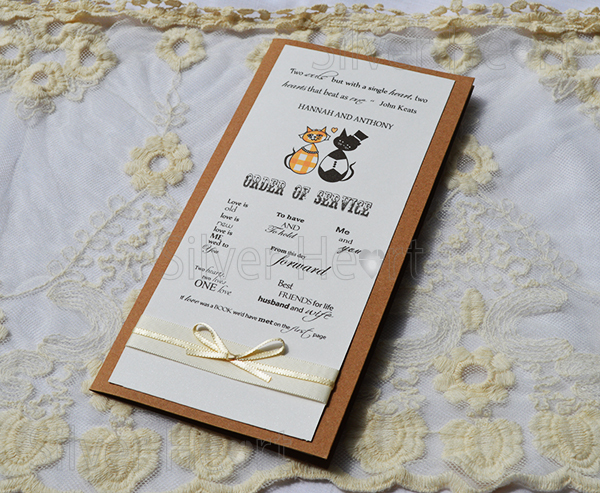 Order of Service designs page. 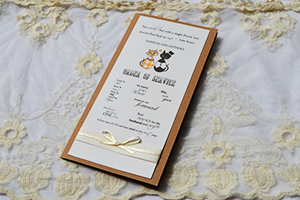 We create order of service to match all our ranges and bespoke designs too. 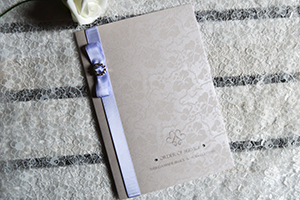 Silver Heart Wedding stationery, Huddersfield, Leeds, Wakefield, Holmfirth, West Yorkshire, Yorkshire, order online, , hand made creations, unique designs, stationary. 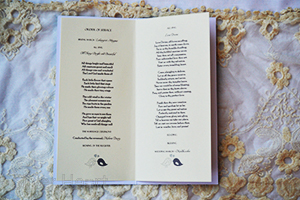 We produce Order of Service/Day cards to suit any type of wedding be it in a church, any other religious institution, or indeed a humanist or civil wedding. We can adapt the wording to suit your needs and of course to make it clear to your guests how your wedding will run. Hover your cursor or click on the smaller images below to see a larger image. For those of you who may not be familiar with an Order of Service or Order of the Day, it is basically a list that maps out the order of events at your wedding. In traditional church weddings this usually begins with the bridal march, hymns, readings and the wedding ceremony itself, of course, follow this. The Order of Service/Day tells your guest what order all of this will occurr in. For a civil ceremony the hymns might be replaced with music playing or poems being read by guests. We can produce Order of service/Day cards to match or coordinate with any of the designs on this web site and, as ever, colours of materials and card can be adapted to match your colour scheme. WHAT OTHER STATIONERY IS AVAILABLE ? We also do Save the Date, Day Invitations, RSVPs, Evening Invitations, Menus, Place Names, Table Names,Table Plans and Thank You cards.